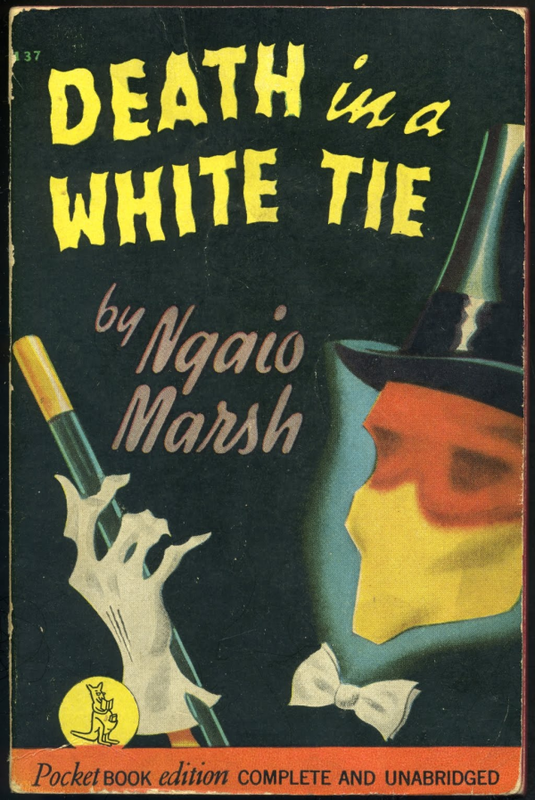 This week’s classic detective fiction podcast scripts catch-up from Why I Really Like This Book is on the tremendous New Zealand author Ngaio Marsh (pronounced NYE-oh). Death In A White Tie (1938) is from the same period as Sayers’ Murder Must Advertise, and shares a theme of a high society drugs racket with Murder Must Advertise and with Darkness at Pemberley. 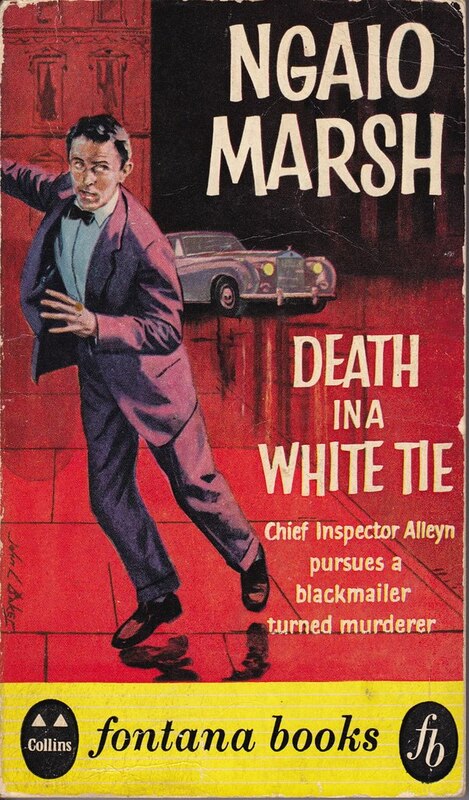 But this was not the only crime which ensnared the English upper classes in Golden Age detective fiction, though you might not think it – Death in a White Tie is also about the terrors of blackmail, and illegitimacy, with a little light illegal gambling as a garnis. Death in a White Tie is a good novel, not just a good detective novel, but it is primarily about detection. We care about the characters because we need to care how their lives will be affected by the crimes, and because knowing how they much they care about the victim of murder will help us unravel who killed him. Inspector Alleyn cares a great deal for the murder victim, who is an old and dear friend of his, an elderly man who wouldn’t hurt a fly, and who has been asked by Alleyn to keep an eye out for information about the cases of blackmail that are beginning to crop up. Alleyn blames himself for Lord Robert’s opportunistic murder in a taxi, and drives himself very hard over the next 48 hours to gather clues and work out who was in the green drawing room at the right time on the night of the Carrados ball. Alleyn is also suffering from the agonies of unrequited love – it must be unnerving having a policeman in love with you, especially if everywhere you go murders and other crimes take place almost as soon as you’ve left or entered a room. Alleyn is in love with a painter called by her surname, Troy, and this novel is Ngaio Marsh’s version of Dorothy L Sayers’ Gaudy Night, where the fighting lovers come together, and the intellectually and professionally equal woman loses her fear of physical intimacy because her 40-year old lover just will not stop nagging her to marry him. The characters in this novel are all inhabitants of high society, as is Alleyn himself. He is an oddity of a policeman since he abandoned a decent career in the Diplomatic service, as befitted his class, for a low life as a policeman, working upwards from the pavement beat. But his class and social connections give him the entrée to all sorts of fascinating crime scenes where regular policemen would simply get nowhere. The victims and witnesses and suspects are his friends, and he gets to interrogate every one of them with the intimacy of long friendship, or at least of having known someone’s brother at school. However, this immersion into late 1930s society is not as realistic as we might assume: despite the late date we hear nothing about the impending Second World War, nor anything about the Spanish Civil War. None of Oswald Mosley’s fascists are lurking as villains or party stalwarts, despite the historical fact of many in the British Union of Fascists being from the upper classes. The high society in this novel might just as well be from the 1920s or the 1880s. The period details have been cunningly left out to keep the characters just isolated enough from history to make them seem timeless, but nonetheless secure in their social position as part of the Upper Ten Thousand who have sat on the top step of English class strata since the Regency. So, Roderick Alleyn’s mother and niece and old friends dine and eat and dance and go to each other’s houses every day and every night in the performance of that annual class ritual known as the Season. Sarah Alleyn is being brought Out by her grandmother, and so she goes to lots of lunch parties and evening dos, and meets other girls, and is paraded around as a marriageable gel. The mothers of the girls work so hard to get their girls married off: the novel is full of sympathetic, or angry, or exasperated remarks by the male characters about how these women work themselves into the ground, they never rest, they exhaust themselves so unsparingly, and how they must all go to nursing homes or to friends’ country houses for the weekend to have a complete rest and do nothing. Their nerves are a mess, they stay up to three or four each morning waiting for the dances to end so they can take their girls home again, and start the rigmarole afresh. It’s a nightmare life of pleasure: we are expected to sympathise with them all as they lie exhausted in their beds each morning, hollow-eyed from yet another series of dances, as they pick fretfully at their letters and sip their morning tea. Not one character expresses any surprise that the servants who invisibly support this attenuated routine might also be worn out, as well as underpaid, and considerably less well fed and housed. The idle rich who exhaust themselves so doggedly in this novel are supported by, and pay for, an army of servants and other contracted labour, but we don’t hear a cheep about their hardworking lives. Of course not: this is not what we read these novels for. Class consciousness is not required, nor is a socialist reading: we read these novels to thrill at the glamour depicted therein. However, we also enjoy the piquant juxtaposition of the great and the good being forced to undergo questions from a mere policeman as to their conduct, their motivations, their movements, their business: all the things the original readers would never dare ask real-life high society individuals on whom these characters were modelled. The subversive nature of the high society detective novel produces a subtle pleasure because it is generated by envy and wish-fulfilment, not something we expect in our reading. We expect to find clues and spot inconsistencies in the characters’ disclosures about their actions, but we don’t always notice that, when we eavesdrop on a police interview, we admire the good characters who behave marvellously. We think they are behaving so well because they accept their social responsibilities and tell the truth, and aren’t rude or offensive, thus allowing us to admire them even more. The bad eggs are the ones who flounce about demanding special treatment and who lie and cheat and hide things from the detectives. If we think about the purpose of the detective novel from this period as a way to make the seriously privileged classes go through a ritual of social humiliation to enable order to be restored in society, then we’ve found a useful social purpose for a delightful form of fiction. All is not perfect in their perfect world. Even the upper classes can have miserable marriages, and not all the girls who are brought Out want to be in that happy gilded circle of privileged persons. The money that the upper classes splash around in pursuit of their pleasures attracts bad people, of course, and this novel has a nice selection of parasitical growths taking advantage of people with too much money to have the courage to spend it meaningfully. Death in a White Tie is much more than who killed Lord Robert: it’s about why that circle of society attracted so much money and bad behaviour in the first place. 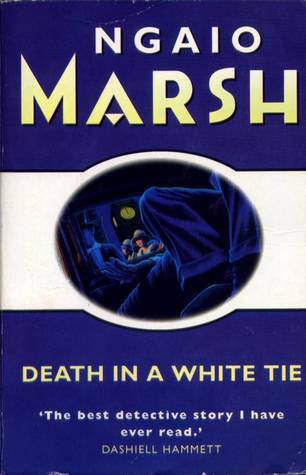 Earlier this year I wrote a much longer post about most of Marsh’s novels, which you can find here.